New mortgage lending collapsed in August, according to the latest figures from the Bank of England. 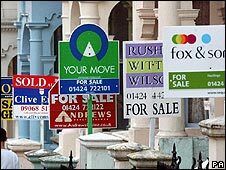 Banks and building societies lent an extra £143m in home loans last month, just 5% of July's lending figure and only 2% of the lending in August 2007. August is traditionally the quietest month for house sales. But house buyers may have been put off buying properties because of the continued fall in prices and widespread predictions of an imminent recession. "The dire Bank of England mortgage data shows that housing market activity is being decimated by the highly damaging combination of stretched buyer affordability and tight lending practices," said Howard Archer, of Global Insight. The Bank's figures mean that for the first time since records began in 1993, the nation's mortgage debt actually fell, from £1,216,728m to £1,216,330m. The Bank of England's data shows that 32,000 new mortgages were approved in August, a new record low and 70% fewer than a year ago. This suggests that the fall in sales and prices will continue into next year. "It is significant that net mortgage lending during the month actually stagnated, reflecting the recent precipitous decline in approvals," said Simon Rubinsohn of the Royal Institution of Chartered Surveyors. "Subsequent turmoil in the financial markets is already having a direct impact in raising some mortgage rates," he added. This was seen in the actions of several of the biggest lenders. Lloyds TSB, which includes the Cheltenham & Gloucester brand, has pushed up the cost of its two- and three-year fixed rate deals by up to 0.26% from this evening. Northern Rock will raise the cost of its entire range of residential fixed and tracker rate deals tonight. On Friday HBOS, which includes the Halifax, withdrew its entire mortgage range for borrowers and replaced it with more expensive deals. "Borrowers now need a 25% deposit to access virtually all its fixed and tracker products," said Aaron Strutt of mortgage brokers Chase de Vere. The lack of activity in the mortgage market has been reflected in the low number of sales at estate agents around the country. "It is quiet, but September was better than August," said Martin Long, based in Inverness for estate agents Bell Ingram. "Small wee cottages and the big country houses are still selling - it's the housing in the middle that is sticking," he added. In Merseyside, Simon Wall from Venmore estate agents says its the properties in the cheaper areas of his patch that are struggling to get buyers. "There's a general perception that there's no point in applying for a mortgage because you won't get one, but that's just not true for everyone,"he added. Trevor Kent who runs his own agency in South Buckinghamshire says there hasn't been much improvement in sales for September in his patch. "It's primarily distressed sales - repossessions, people getting divorced and those struggling with debt - that are selling. "Average houses at average prices are not exciting interest." Within the mortgage industry, building societies saw their lending shrink for the third month in a row. The Building Societies Association (BSA) said in August its members' customers repaid £38m more than they borrowed. "Activity in the housing market remains depressed," said Andrew Gall, of the BSA. "With the Land Registry data showing a 4.6% annual drop in property prices, and with BSA's own property tracker survey showing that more than half of people consider the prospect of future falls in house prices a barrier to house purchase, it is hardly surprising that demand for mortgages is so low," he added.